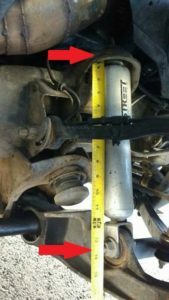 What Coilover Brackets Do I Need? I can’t tell you how many times I have heard this one. The typical internet line goes something like, “you need to swap [to numerically lower] gears to load the turbo better” or “you will go faster with a higher (numerically lower) gear with a turbo” or “turbos like load those steep gears are not turbo friendly”. The first one is very misleading, the second one is also most likely false in 99% of cases, and the third one just doesn’t make sense, so let me explain in plain language. I’m not going to dive a mile into the technical aspects of how a turbocharger works (but I can recommend some good books if you like that sort of thing), but basically the exhaust from the engine transfers energy to the compressor through the turbine wheel by means of temperature and pressure. The compressor wheel and turbine wheel are mechanically linked with a shaft. The compressor wheel is rather picky about what flow rate and pressure it works at, which is why compressor maps are so important when picking a turbo (discussion for another day). Don’t forget the fact that compressing a lot of air takes a lot of energy regardless if it is through a belt such as a supercharger or through the exhaust like a turbocharger. 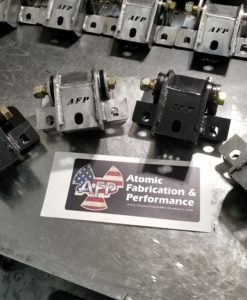 When cruising to full throttle turbos generally operate in the range of 20,000rpm to 100,000rpm depending on size and output pressure and flow. At idle you can generally stop a compressor with you finger depending on a lot of things, but I don’t recommend trying that (seriously, don’t try that). So lets say you are at a dead idle and you floor the throttle, lets see what happens. The vacuum behind the throttle body goes to 0 (atmospheric pressure) and the engine speed increase. More fuel and air are going through the engine as its speed increases so the heat and pressure in the exhaust between the engine and turbine wheel also increase. 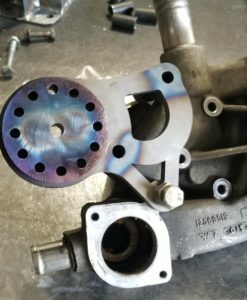 All turbocharger assemblies (assembly being the turbine and compressor wheel) have a certain amount of mass and inertia and take time to change speeds. Because there is not a direct link between the engine crankshaft and compressor (like a procharger, for instance) the exhaust gas is the only way to transfer energy to the compressor, and it takes time for this transfer of energy to be absorbed by the turbine. The compressor always requires a certain amount of power to spin. At idle this is basically zero, but when a big turbo is moving a lot of air at a high pressure it could be consuming hundreds of horsepower! The larger the difference in the amount of energy currently required by the compressor and the amount of energy being fed to it via the exhaust, the quicker it will accelerate. Same concept as the bigger the temperature difference between objects the faster heat moves, and the bigger the difference in air pressure the faster air will move. What do gears have to do with all of this? Ask yourself, on a Naturally Aspirated engine, what determines how fast you go through gears? Lets assume its a manual car to eliminate the torque converter so the answer would usually boil down to drive ratio (transmission x rear end gear ratios) and engine power. More power obviously accelerates faster, but steeper gears (and the focus of this discussion) means the engine has more mechanical advantage (more leverage) over the tires. Steeper gears do not give you any more power (less actually, because there is some friction loss there), but they do give you more leverage which makes it feel like the car has more power. The tradeoff is with top speed. Anyone that has been in a 4WD truck with 4-LO (or a “granny gear”) knows this. You can double the gear ratio using a multi-speed transfer case, but your top speed is cut in half. Same thing as on a bicycle between the “uphill” gear and the “downhill” gear. 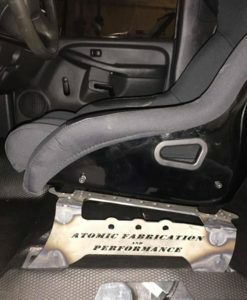 Yea, ok, so what does this have to do with a turbo? When you floor it from a dead stop (from 2 paragraphs ago), the turbo extracts that energy to speed up, but it needs time to do this because the turbo has to go from near 0 speed to 50-100k rpm! Most centrifugal compressors (turbos) are not able to make any boost until they are going extremely quickly, lets call it 50k rpm to make any boost. Their speed is directly determined by the balance of the energy required by the compressor and the energy supplied by the engine and turbine wheel. The more disproportionate the balance, the faster the acceleration. When the car has a very steep gear (lets say, 4.88 gears) the engine can rev very quickly through its shift points, but this means it does not give the turbo time to accelerate much so you may not see much boost in the shorter first few gears. On the other hand, if you have a long gear (lets say, 3.08 gears) then the engine cannot accelerate quickly because of the lack of mechanical leverage on the tires, but this also gives the turbo lots of time to absorb the energy from the exhaust and speed up with the result being it appears to make boost relatively quickly. On one hand you have a high mechanical leverage via gears but not much boost, and on the other you have low mechanical advantage but more boost, so which one is better? Well that really depends on your goals. Most people add turbos to their vehicle to go fast, so if that is your goal, assuming you don’t gear so steep as to not be able to hit the top speed you want, the steep gear will always be faster in a race than the shallow gear with everything else being the same (boost level, turbo, engine, etc.). Steeper gears will not make boost as easily, but the point is to go fast, not just make boost. It seems wrong that the setup that makes the lesser boost would be faster, but let me explain. Even though the engine is making more power with more boost, the total tractive effort (that is the force transmitted through the tires to the ground to actually accelerate the vehicle) is most likely less. This obviously depends on how much boost you are running and how far apart the comparison points are, so lets use a realistic comparison with everything being the same except boost and gears. In terms of tractive effort, this is basically going to be torque x gear ratio (everything else cancels out because they are the same), so Case 1 has (500*4.56) 2280ftlb of tractive effort and Case 2, although having a lot more engine torque, only has (650*3.08) 2002ftlb so Case 1 will be faster. This assume Case 1 does not run out of gear before the end of the race of course. Most real race cars are set up to use the steepest gear possible for exactly this reason. For fun, if Case 1 were to turn up the boost to the same level as Case 2 (15psi, 650ftlb) then he would have (650*4.56) 2964ftlb of tractive effort. Top speed is a little harder to figure out because you need to match the engine’s powerband to the speed you are going. Drag is exponential so as you go faster you need more power obviously, but its important the engine’s power band is increasing at roughly the same rate as the drag is increasing so you can keep going. Your top speed is determined by the balance of drag and forward thrust of the car. The missing link to the internet myth that is ignored is the time factor. Because turbos operate at such a huge speed range and are not mechanically linked to the crankshaft, there is a time delay when the compressor is accelerating. Ideally you want the turbo to slightly outrun the engine so you have boost early and it never drops. In practice this is harder to do and there are a myriad of anti-lag techniques and devices on the market to help with this, but for your typical street car the rear gears have a significant impact on overall feel and performance. For a DD or weekend warrior I generally say don’t bother changing your gear ratio and let the turbo do the work (balance between driveability and performance), but for a race or aggressive setup it will always be faster to put as steep of a gear as the tires and top speed requirements will handle. Don’t fear the gear! This is the most common question I get about how to pick which bracket kit you need. It is pretty easy to figure out based on what you are wanting between lowered, stock height, or lifted, so lets walk through it. 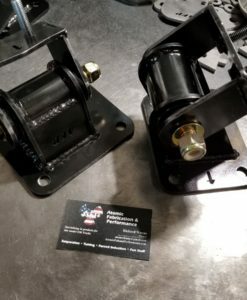 Will your brackets work on a 2500 or 2500HD? The short answer is no. My brackets are intended for the 1500 trucks. 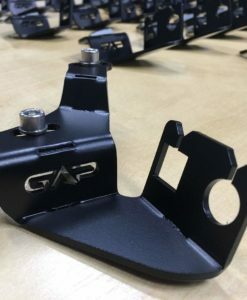 My upper brackets can be used on the 2500s, however they will need to be welded instead of bolted due to the frame differences between the 1500 and 2500 frames. The Lower brackets are not compatible. The first thing to talk about is the “upper reinforcement brackets” that are part of the normal kit. The “lifted upper brackets” are something different. These are not mandatory to do this swap. What they do is reinforce the frame area to better help support the load of the vehicle. 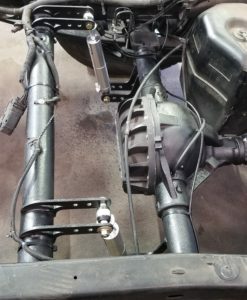 The shock hoop on the frame was not designed to carry the full weight of the vehicle (it was only designed for the shocks), so these brackets help reinforce this area. With that said, many guys have done this swap with just the lower brackets not using the upper bracket so it is certainly doable. The choice is up to you. The brackets will take up 3/8″-1/2″ of height in extreme situations. I generally only recommend the stud top when you are height limited which generally only happens with extremely low setups. 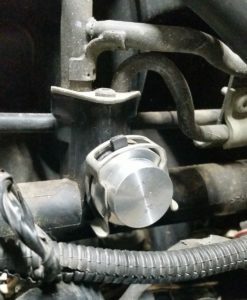 You can use the stud top with other setups if you want to put a longer travel shock in there, but most of the time it is not needed and the procomp shock adapter comes out a little easier and cheaper. You can generally get another inch of shock travel using the stud top vs the procomp adapter on the same height vehicle. You will need the lower brackets of course, with the upper brackets being optional (both of them together is what is called the “full normal kit”). You will also need the stud top bushings since this is quite a bit of drop. You will need the lower brackets of course, with the upper brackets being optional (both of them together is what is called the “full normal kit”). You may use the stud bushing for more travel if you are concerned about shock travel, but that is generally not needed and not an issue. The procomp adapter works perfectly fine in this range, but either style will work. You will need the “lifted brackets” for this range. 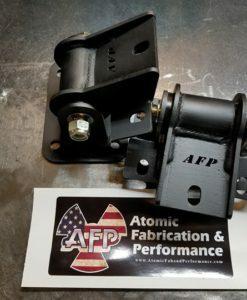 They are the same lower brackets as the other kit but the upper brackets are different that include an integrated mount for the shock instead of using the procomp adapter or the stud top bushing. They do this to move the mounting location over to create some clearance to the UCA. These brackets are slightly more difficult to install so I dont recommend them on other height setups (even though they will work fine) that don’t require them. When you order, please add this measurement in the notes section and include some details about your truck such as year, model, intended use, and any heavy accessories you have installed. When you measure (see picture), make sure the truck is on the ground with weight on the wheels and try to get it as close to the height you want. If you want to go higher, use a floor jack under the frame to put it where you want it then measure. If you are lowered then measure as it sits and tell me how much lower you want to go than it currently is. 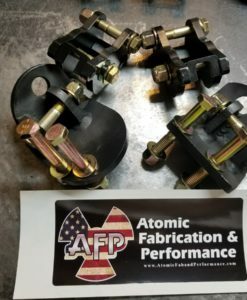 I don’t generically list springs and shocks since every setup will be a little bit different and I want to make sure you are happy with it. If you don’t want my help that is perfectly fine, but if you do want help selecting springs and shocks please include this measurement.